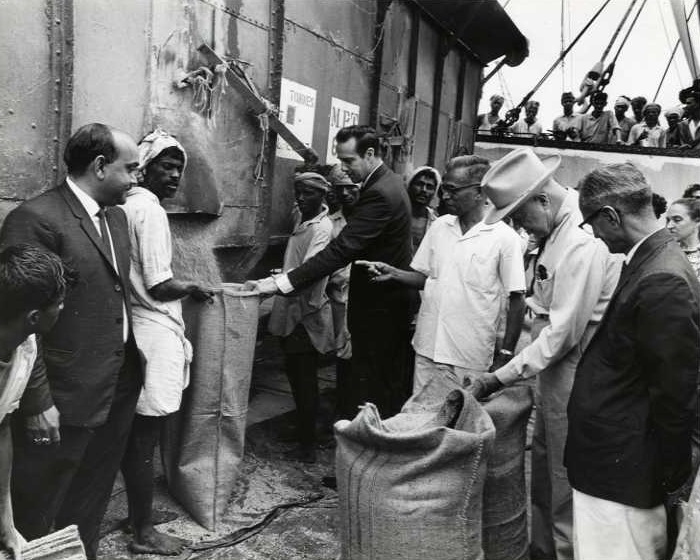 Congressmen William R. Poage of Texas (with hat) and Robert J. Dole of Kansas (dark suit center) watch the unloading of American food grain in Madras harbor December 19. The three-man U. S. Congressional Delegation led by Congressman Poage visited India to take a first hand look at some of India's agricultural achievements and problems. The other member of the Delegation was Senator Jack R. Miller of Iowa. United States Information Service (Bombay, India). "Photograph of Congressmen Poage and Dole watching the unloading of American food grain." W. R. Poage Papers, Box 622, File 4, India 17-04-103, December 19, 1966, photograph by R.N. Khanna, W. R. Poage Legislative Library, Baylor University, Waco, Texas.. Accessed 25 April 2019. http://acsc.lib.udel.edu/items/show/132. W. R. Poage Papers, Box 622, File 4, India 17-04-103, December 19, 1966, photograph by R.N. Khanna, W. R. Poage Legislative Library, Baylor University, Waco, Texas.